Waterbury 'Spider' Novelty 8-day Clock It is listed by Tran Duy Ly as the 'Spider' model made in 1912. The dial is porcelain and in very good condition. 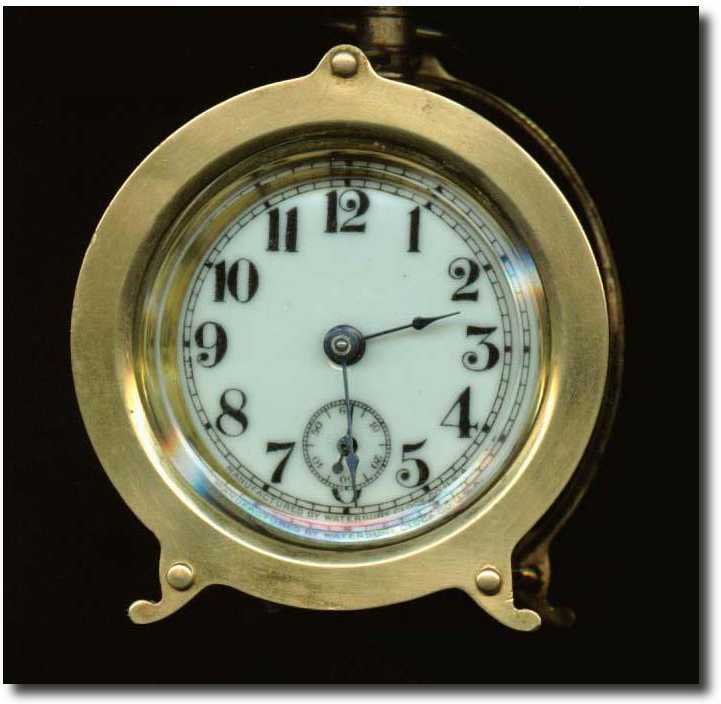 It is inscribed with 'Waterbury Clock Co. U.S.A.'. All the glass is original to the clock. The front glass is beveled and without chips. The cylinder glass has some fractures at the bottom that have been stabilized. These cracks do not show unless the clock is turned over. The case is gold-plated with most of its original rich plating. The movement has recently been cleaned and retains its gold plating as well. The back is marked with four patent dates: May 6, 1890; Nov 11, 1890; Dec 23, 1890; Jan 13, 1891. The clock is in good working condition. It measures 4 inches high (including the handle), 2 deep (including the winder) and 2 inches in diameter.